Memory Lane Friday is a weekly blog carnival, where you can blog about your memories and link up. All are welcome. Today's theme is 6th grade. So I went to 6th grade in the 80s. Here I am sporting my super cool 80s sweatshirt, along with my Safety Patrol gear (nerd alert!). I never could get my bangs to tease up as well as the other girls. The mom of my friend, Chelsea, who was a psychologist, came to school to talk about her profession. She brought with her a brain, in formaldehyde. I was fascinated, and touched it when she took it out. Another girl had to run to the bathroom to throw up. Playing a game called four-square with a red ball during gym almost everyday. Making a globe out of paper mache and painted continents. Long summer days at the barn with my friend, Chelsea. She'd let me ride her horse Bargain. The era of the pogo ball. I could hop mine around the entire neighborhood. Mine was purple and green (slightly more fluorescent than this picture I found on google) and had a full disk instead of the disk with the edges bevelled in. My Dad got Rocky Mountain spotted fever, and had to rush to the hospital. It was terrifying, because I'd never really seen him sick before, other than a cold here and there. Helping my friend, Nicole, deliver papers on her paper route. Dollar matinee movies - Big Top PeeWee comes to mind. A chemistry set, in the basement. And no, I didn't blow anything up! Would you like to link up to Memory Lane Friday? It's easy. Just add your website to the linky. Be sure to visit the blogs of others who link up, and leave them a comment too. Next week there is no theme. Oh I love 6th grade memories but never want to go back. I had big bangs and finally got rid of my ugly glasses in 6th grade. And we were also playing a lot of four square. Got our duct tape coin purse in the mail. Miss E has it in her purse! Thank you kindly. Those are great memories! (Aside from you dad getting sick, that is.) Fun stuff! School Safety. I would vote for you for Sheriff. My son now 48 yrs old was a school patrollman when he was in 8th grade. His most horrifying duty was to get on the bus and walk the Isles checking for items left from the morning run. Before he could finish, this 2nd grader girl with two blond tufts of hair on either side of her head would board the bus and before he could defend himself she would Kick him rapidly. It was a favorite story I looked forward to every day. Of course my son could realy add to the terror of the moment. Those days are fading in the distance. I don't think I could have jumped around the neighborhood. You were athletic even then. oh man. i was a patrol! but in the 5th grade. also. we didn't have to wear those hats. whew. um. in 6th grade. well. i don't remember much about it. maybe it's because of all the skirmishes i got in as a patrol. hmmm. probably a hat would have been a good idea. You were way too proud and cute about your safety patrol duties! I never got enough of Four Square either. You have a LOT of memories from that time. 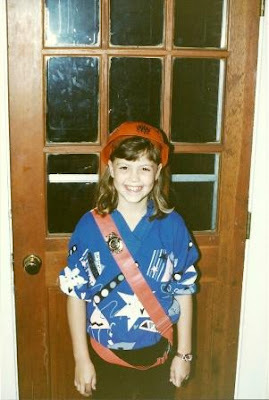 You were a cute safety patrol! I remember playing a game some of us made up called "Over the Limb" where we'd throw a ball up and over the limb of a huge old tree in the playground-that was fun-but 6th grade math was not! I love that you were a patrol officer. And we did have a chemistry set and very nearly blew things up. I loved 4 square!! 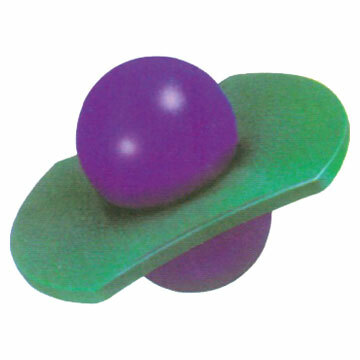 And that pogo ball...they still have it! I bought one for the girls (maybe it was more for me?) :D That thing is still hard to use! I just bought tiny Hello Kitty press on nails for Anne Marie! Still had to cut them down for her little fingers. She took the brain OUT???? Can you even do that? And you touched it??? Ewwwww! You were a brave girl! 6th grade. The best year ever except for the boys!! Such fun memories. And Memory Lane Fridays looks like a lot of fun. I'll think about it. My parents got a divorce and I had to go live with my Aunt. So 6th grade was a huge upheaval for me. Great memories of your 5th grade. I went to a Catholic grade with nuns. And in the sixth grade we had a nun that would pay basketball in her nun's habit. All the kids thought she looked funny. Ah.... 6th grade. The BigTop PeeWee is making me laugh. What fun memories. You were so cute - love the smile and the happy cheeks. And you could actually do the pogo ball? Impressive. You are/were adorable. And my bangs never, ever behaved either. that sounds about like the time my daughter was in 6th grade because I remember the Pogo ball and the ever important bangs...I remember her and her best friend labored over those for hours...it's so funny now to think of this!